Hey DJ! This is the mixer you want if you need a box that can rock the house all night long! Built with the same quality design and forward thinking technology that we can expect from this team this mixer goes above and beyond, providing the DJ with every tool needed to keep your crowd dancing and smiling. The DMXB3 Professional Double CD 2 Channel Mixer is an all in one CD mixer built with a rugged design meant to hold up in the club while keeping the place hot! Connect this mixer to your set up from the back panel using the balanced XLR, RCA master out and RCA record out outputs. 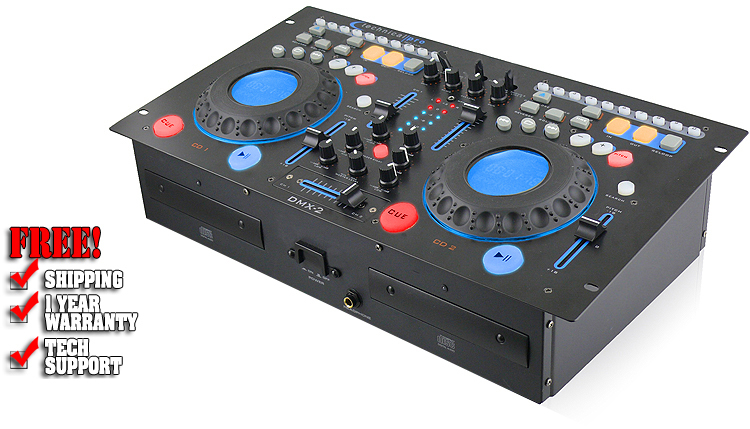 Utilize the rack mountable design and easily integrate this into your mobile rig or DJ coffin. Easily load 2 different CDs into the front loading CD decks. Connect a microphone and have the ability to talk to your crowd while mixing! All of the controls are very sensitive and have a smooth, solid movement and action to them. In a dark night club everything will remain illuminated and allow you to easily see what you are doing while mixing. The unit allows for up to 20 Programmable play tracks. If you are a professional DJ then you plan your sets according to what type of crowd you expect you can pre-program 20 tracks to play and have continuous music based on the crowd’s needs! Built for the seasoned professional DJ and for the DJ that is just starting out, the DMXB3 has all the features you will ever need! Make a loop on the fly, use the rubberized jog wheel to cue your tracks, EQ your songs using the bass, mid and treble tone controls per each channel, pitch your music up or down and match your beats using the seamless pitch control…you will feel the quality build ever time you cut the fader! These are the tools that separate the person that just “plays” music from the DJs come to rock the house! Aligned with Technical Pro’s rugged design and long lasting build for all their gear, the DMXB3 has a built-in anti shock system the helps prevent any skipping or playback issues. The sound output utilizes an analog to digital converter at 24 bits with 8 times oversampling which means this bad boy will sound thick and full, lighting up any room with that “Big Room” club sound DJs strive to achieve! If you are a DJ and need a reliable, quality built mixer that can do it all, this is for you…and at a price that won’t break the bank!